I was quite impressed the other day when a few of us from the Lanka Linux User Group (LKLUG) visited the National Institute of Business & Management (NIBM) as a result of an invitation we received a little over a month ago, to deliver few lectures. 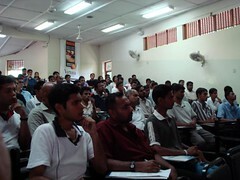 The event was held on the 24th of June. I thought they did a fantastic job in organizing the event by inviting us well ahead of time and following it up with suggestions for topics to talk of and later fixing a proper time slot that was convenient. Surprisingly this was the first of such an event and they had even made it a public event (which we were unaware of until later), and had yet managed to fill an entire auditorium of about 90% outsiders. It was only a couple of years ago that LKLUG first walked into NIBM and planted the seeds of Free & Opensource software by conducting a 2 day workshop on GNU/Linux. Therefore I think it was quite rewarding for us to see how organized and determined they have become in executing this event. Cloning my notebook...and then mutating it! Ubuntu [Drapper] Launched in style!